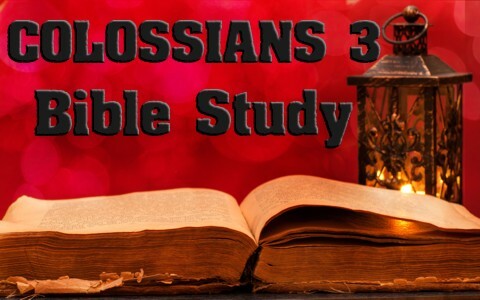 Here is a Bible study with a summary and discussion questions over Colossians chapter three. I noticed that the Apostle Paul doesn’t say “since” but “if” you have been raised with Christ, perhaps recognizing that there are always going to be tares growing along the wheat, he says “if” and not since. For those who are Christ’s, they must set their minds on the things above and not on earthly things since these are passing away but the things of heaven remain forever. Is there anything wrong with thinking about things here on earth? Why does Paul say “if” rather than “since” in speaking about those who have been raised with Christ? Paul speaks as if we can kill the lusty or fleshly desires in our bodies and warns that things such as sexual immorality (which he puts first in rank or order) is going to bring the wrath of God upon all who continue to walk in these things but he does contrast the fact that we used to walk in these things, assuming that we do so no more. How can we “put to death” what is earthly in us? Does Paul put sexual immorality first for a reason? This Bible verse shows us that we all have hope in Christ and that God is no respecter of persons, race, or social standing in life. Elsewhere, Paul writes that “God shows no partiality” (Rom 2:11) just as The Apostle Peter said in Acts 10:23. Job expands on this truth in saying that God “shows no partiality to princes, nor regards the rich more than the poor, for they are all the work of his hands” (Job 34:19). Does God make distinctions between people of substance and people who are poor? Paul speaks about putting on the things of God like we would put on clothing and maybe that’s because they don’t put themselves on us by themselves. We must participate on putting these things on just like we must take the initiative of putting on the armor of God (Eph 6:11). Paul also says if we have a complaint against someone, rather than addressing it with the person, just forgive them as God has forgiven us. Are these fruits of the Spirit or just evidence of our being saved? The Greek word for “rule” as in “let the peace of Christ rule in your hearts” is like that of an umpire. The umpire makes the call but we must also participate in this as Paul says “let the peace of Christ rule in your hearts” which tells us that we must allow this peace to rule in our hearts. The Apostle Paul suggestion includes, “whatever you do, in word or deed, do everything in the name of the Lord Jesus, giving thanks to God the Father through him” (Col 3:17). How does peace rule in our hearts? Just because Paul tells wives to submit to their husbands doesn’t mean that they are inferior or less spiritual. In fact, women are co-heirs and co-equals with men but just as Christ submitted to the Father, still being equally God, He yielded to the Father’s will. The husband doesn’t have it any easier and in fact, it is more difficult because husbands are told to love their wives in the same way that Jesus loves the church and died for us, so “don’t be harsh with them” since Christ’s not harsh with us. Paul also addresses children and even advises fathers, but first says, “Children, obey your parents in everything, for this pleases the Lord. Fathers, do not provoke your children, lest they become discouraged” (Col 3:20-21). Why would Paul say “do not be harsh with” our wives? In summary, Paul says that whatever we do, do it as if we’re doing it for Jesus Christ, because we are. We don’t really work for an employer but ultimately for God Who is the One Who will reward us on the day of His return. Our inheritance is our reward, not a paycheck or the praise of men. Why does Paul see us as working for the Lord and not for men? What is our inheritance that will be our reward? The Book of Colossians, Chapter 3, verses 1-12 is what I would call a self-check or faith diagnostic for the believer to assess their walk with Christ. It gives us things that should be present in our life and the things that should not be associated with. It’s like a car’s dashboard which signals when there’s something wrong and what “normal” is for the believer so when you read and study Colossians 3, examine yourself, as I do, to see if all is well or we need to repent of some things and confess them to God so that we might be cleansed from all unrighteousness (1 John 1:9).